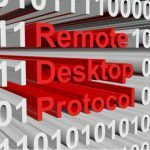 The remote desktop protocol RDP software is used to provide access to a desktop or application hosted on a remote host. It allows you to connect, access and control data and resources on a remote host as if you were doing it locally. The primary use of RDP software is remote administration and implementation—for example, when software users are away from the IT department. RDP software is also useful for “headless computers,” meaning computers without direct input/output devices such as a monitor, keyboard, and mouse. Many times, a KVM switch is used from one computer that has a monitor, keyboard, mouse, and remote-control software to control many headless computers. RDP software works as a system where a user can connect to and use a specific remote host from anywhere, anytime. The most common example is accessing your work computer from a PC, laptop, or tablet at home, enabling you to access available resources and do everything you normally would do at work. With the evolution of Microsoft Desktop Services (formerly known as Terminal Server), the importance of RDP software has grown significantly. Businesses all over the world use and rely on Microsoft RDS to deliver applications and desktops to their employees from any location, enabling bring-your-own-device (BYOD) policies, telecommuting, and mobile access. Businesses were looking for alternative methods to locally installed applications and desktops. RDP software and Microsoft RDS were the answer, providing the right set of tools to deliver applications and desktops as a service from a central location. By centralizing application and desktop management, businesses reduce complexity and operational costs related to updates and security patches. IT staff no longer has to go desk by desk to update applications or provide help-desk assistance. The cloud-computing technologies enable organizations to free IT staff and budget from repetitive tasks, repurposing resources for more pressing projects. Outsource the entire IT operations to a service provider. Getting applications and desktops delivery as a service substantially reduces the internal IT staff’s workload. Co-manage the systems between the provider and one or more on-premise administrators. Manage and deliver applications and desktops internally. A significant issue with RDP software was the poor quality of graphical interface due to network connectivity. To resolve this issue on graphic-intensive applications, Microsoft released RemoteFX, which is an enhanced version of RDP. It supports both TCP and UDP connections. Windows Server 2012 enhanced this protocol even further. It offers features such as adaptive graphics and multi-touch support. By utilizing adaptive graphics, rendering is done on the server-side and not on the client device. With the enhanced features and popularity of Windows, RemoteFX now dominates over other communication protocols. Developed around Microsoft’s RDP protocol, Parallels® Remote Application Server (RAS) lessens systems admins’ workload by leveraging templates and wizards for quick deployment and management. It’s straightforward to implement and maintain, so admins can manage and quickly adjust the Parallels RAS farm without needing any specialized training. Because of its comprehensive features and multisite support, they can build solutions to meet the requirements of any organization, regardless of size and scale. Try Parallels RAS today with a 30-day, full-featured trial.